Interview: Alexander Orn Numason of The Vintage Caravan – Spotlight Report "The Best Entertainment Website in Oz"
We had the chance to chat with Alexander Orn Numason, the bassist of Icelandic psychedelic rock band The Vintage Caravan. We chatted about their upcoming album ‘Gateways’ being released at the end of this month and the delay’s in the album’s release, as well as their upcoming tour plans. SR. Your new album ‘Gateways’ is coming out soon, how are you feeling about that? It’s great, we’ve had plenty of time to prepare it because the initial release was delayed about six months. It gave us some extra time to perfect it. We’ve also had some changes in our management team since then, I’m curious to see what this new album will bring for us. SR. What caused those delays in the release? It was a crazy situation. Our producer was supposed to start mixing the album early this year, but unfortunately he had a seizure while he was driving and ended up in hospital. Because of that, he couldn’t start mixing the album at that time, which delayed the mastering. The label had to delay the whole process for six months while he recovered. He is fine now, but it was a crazy few months. I’m glad that he ended up mixing the album for us, he’s an absolute magician. It was really cool working with him, and he had a hugely positive impact on the album. It ended up being a great experience. SR. This is your fourth album so far, what have you done differently with this one, compared to previous releases? We’re a lot better at obtaining the sound that we want now, this producer helped a lot with that as well. We’re a little bit more confident in our songwriting now, and for this album we focused really hard on what each song needed. We also focused on tailoring the songs to the vocals, in terms of the key, and the songwriting in general. SR. You’re the bassist of the band, did you change up your gear for this album? I used a few new amplifiers. I had a MESA Big Block, I had an old Ampeg tube amp. I ran that into an eight by ten cab for a gritty sound, and I was used a Fender Studio Bass combo amp from the seventies for the clean sounds. They were in a really small isolation booth, which was insanely loud, but basically it created a wall of sound. On top of that I was using the distortion pedals I always use, a ZVEX Distortron and Fulltone fat-boost, stacked on top of each other. They’re fantastic pedals. SR. What sort of bass were you using for this record? I have five different Fender Precision basses, and two Fender Jazz basses. I ended up playing my main jazz bass for almost all of the songs. It’s a 2012 Fender Deluxe, it’s very nice to play. SR. Have you got any plans to come over to Australia. We always have that in the back of our minds. As a band from Europe, it can be difficult to work out what area to go to next. We’ve done some stuff in South America, and we’ll definitely be heading back there for the album’s touring schedule, but Australia is definitely one of the main places we want to go to after that. I’m fairly sure we’ll be able to tour there in 2019, so stay tuned. SR. Awesome man. What was the inspiration behind the album artwork for ‘Gateways’? That was done by a great friend of ours, Julian Haas. He runs this thing called Through the Haze, look him up. He is an amazing photographer. At the moment, heaps of stoner rock band are going with illustrated album artwork, so we wanted to do something a bit different and bring in a photographer. We sat down with the photographer and told him what our ideas were. He’s a creative genius, he managed to capture exactly what we wanted. SR. Have you got a favourite track from the new album? That’s like trying to choose your favourite child *laughs*. I have a few favourites in different respects, they mean different things to me, and represent different emotions. At the moment my favourite is the first single we released, ‘Reflections’. SR. Your album has been described as an “addictive masterpiece”, how do you feel about that? That is a really amazing compliment to us. I’m really happy with how people are taking to the album so far, I really hopes everyone likes it that much. SR. Your tracks ‘Reflections’ and ‘Set Your Sights’ have already been released, do either of those songs have a special meaning to you? I can’t really say that they’re any more special than any of the other tracks on the album, there are definitely tracks that have much more significant meanings. Oskar and I are the lyric writers in the band. SR. Have you got any music videos planned for this album? There’s a music video for the track ‘Reset’ that’s coming out pretty soon, in about two weeks, and we’re pretty happy with that. It really comes down to our budget, but we’d definitely like to do another music video for one of the other tracks. We’ll just have to see how everything happens over the coming months. SR. What’s the music scene like over in Iceland? It’s amazing, it’s very vibrant and active. Bands are good friends with each other, it’s an awesome community. SR. What sort of music did you grow up listening to, and which bass players have influenced your playing style? Those things go hand in hand really. I’d say early Metallica, Rush, and Rage Against The Machine. My parents were quite young, so when I grew up they were listening to a lot of grungy stuff like Soundgarden and Alice in Chains. The bass players from all of those bands have definitely influenced how I play. SR. If you could collaborate with any artists, dead or alive, who would it be? That’s a hard one, I’m drawing a blank. I guess anyone from those bands I just mentioned, I’d be pretty stoked to play with them. SR. What’s your favourite song to play live? Recently the track ‘Crazy Horses’ has been a lot of fun to play live, it’s been first up on our set list, and it always gets a great crowd reaction. In terms of our new stuff, the opening track ‘Set Your Sights’ is really fun to play live. It definitely gets peoples heads banging. Stay tuned, we’ll be going down there sometime soon, it’s high on the list of our places to go. I hope to see you guys soon! 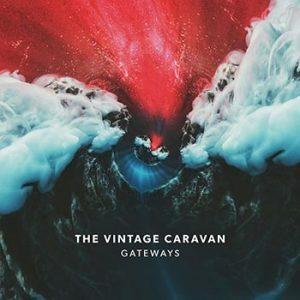 Follow The Vintage Caravan on social media to keep up to date with their new album ‘Gateways’, out 31st August and their upcoming tour plans, and their stoner rock shenanigans! Spread the word, and we may see them here very soon.